Celebrating the life of Alonza Hollis Jr.
Be the first to share your favorite memory, photo or story of Alonza. This memorial page is dedicated for family, friends and future generations to celebrate the life of their loved one. 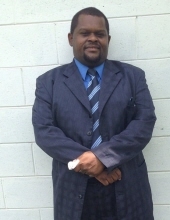 Obituary for Alonza Hollis Jr.
Alonza Hollis Jr. Age 45, born December 6, 1972. Departed this life on Thursday August 9, 2018. He was educated in Jeff Davis County and attended the Jeff Davis High School. He was a very gifted singer of gospel music. To send flowers or a remembrance gift to the family of Alonza Hollis Jr., please visit our Tribute Store. The family and friends with gather on Thursday August 16,2018 at 2:00 PM at King Brothers Funeral Home for a procession to Denton City Cemetery for Burial. "Email Address" would like to share the life celebration of Alonza Hollis Jr.. Click on the "link" to go to share a favorite memory or leave a condolence message for the family.